Considering the popularity of the original Cleito, we expect the Aspire Aspire Cleito Exo Tank to be a big winner with it’s updated top airflow and sleek reduced-window design. Designed to maximize flavor, there are two different versions available: the 3.5ml Standard Version that uses a 0.4 ohm (40-60W) coil and the 2ml TPD Version with a 0.16 ohm (60-100W) coil. To top it off, the Cleito Exo Tank is still compatible with the original Cleito coils giving you plenty of flexibility. It comes in several attractive colors and features a leak-free, top-fill design. 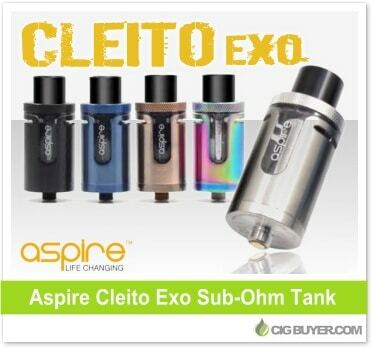 * Learn more about the Cleito Exo Sub-Ohm Tank from Aspire Vape Co.